The Kings and Pelicans have discussed a DeMarcus Cousins deal, according to multiple reports. The Vertical first reported that the Kings, who had been believed to have cooled on the idea of trading their star center, engaged in trade discussions this weekend, including the Pelicans. Michael Scotto of Basketball Insiders reports that New Orleans’ potential package would include shooting guard Buddy Hield (last year’s lottery pick) and multiple Pelicans future first-rounders. 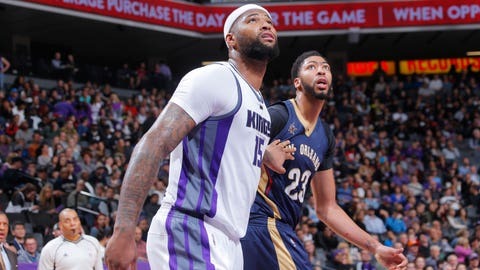 New Orleans is currently hosting All-Star weekend, with Cousins set to line up alongside Pelicans star (and fellow University of Kentucky product) Anthony Davis with the West All-Stars. Cousins, 26, remains the NBA’s pre-eminent low post scorer, averaging 27.8 points and 10.6 rebounds and 4.8 assists this season. His name has frequently come up in trade talks over the past few seasons.